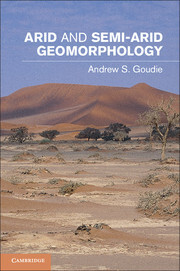 Based on four decades of research by Professor Andrew Goudie, this volume provides a state-of-the-art synthesis of our understanding of desert geomorphology. It presents a truly international perspective, with examples from all over the world. Extensively referenced and illustrated, it covers such topics as the importance of past climatic changes, the variability of different desert environments, rock breakdown, wind erosion and dust storm generation, sand dunes, fluvial and slope forms and processes, the role of the applied geomorphologist in desert development and conservation, and the Earth as an analogue for other planetary bodies. This book is destined to become the classic volume on arid and semi-arid geomorphology for advanced students and researchers in physical geography, geomorphology, Earth science, sedimentology, environmental science, and archaeology.